The garden starts looking a bit tired, by late August; and I’m certainly feeling a bit tired, too. After all, we’ve been at this now since February when our gardening season began a bit prematurely, with a string of days in the 80s. And we have a few more good months of gardening still ahead this year. The garden is getting a good, deep drink today. It began raining here sometime after midnight, and I was awakened several times in the night, listening to the heavy rain pounding on our roof and on the trees. And we needed this rain to soften and re-hydrate our summered out soil. A storm is moving up the coast. The forecast keeps shifting, of course, but we’ll harvest a few inches of rain before this low moves away from us and out into the Atlantic. This is the time when some might give up for the year. After all, things look a bit overgrown and shabby after weeks of heat and too little moisture. A lot of plants in the garden have pretty much finished up for the season, or are taking an untidy nap. Things might have gotten a little out of hand while we were traveling this summer, or while it was too hot to reasonably work outside. Joe Pye Weed takes center stage in the morning sunlight last week. September, almost upon us, offers a reprieve and a fresh opportunity for us all. Students get a new semester. Adults return from vacation, refreshed. And gardeners get a beautiful autumn in the garden. Autumn may be the best gardening season of the year. Many perennials have matured into their full potential for size. The garden’s silhouette may be more full and lush than at any other time of the year. 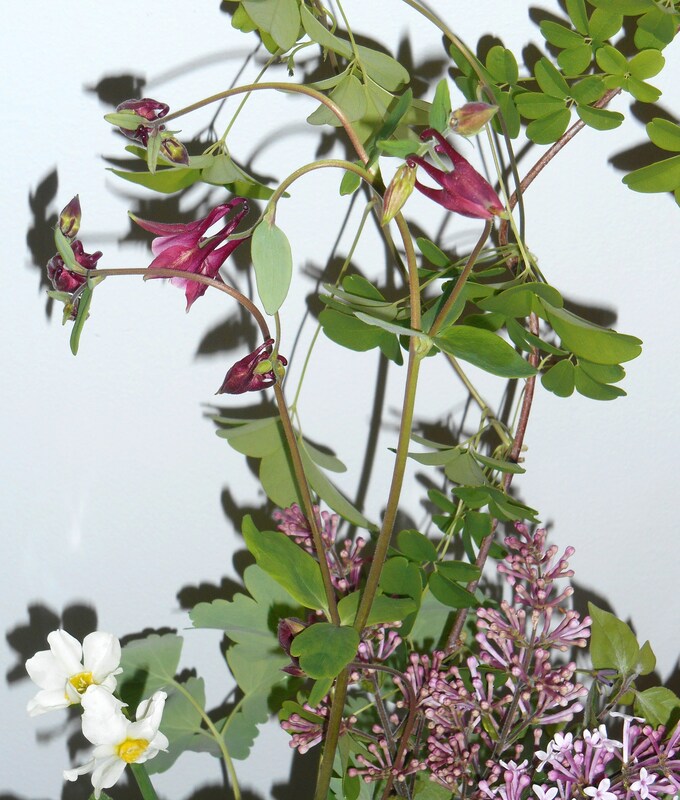 Colors in both flowers and foliage are rich and intense. The air is cooler, the sky bluer, and the sun less intense. This is the best season to give new shrubs and perennials a chance to establish and grow their roots out into the surrounding soil during the cool of the year. Pokeweed has overgrown the Salvia, Colocasia and Hibiscus that have grown here for the last several summers. They are just holding on beneath its shade. I’ve been refreshing our garden, preparing for the change of seasons. I’ve been cutting back browned leaves and stems, lifting mats of grass growing into my beds, deadheading, and replacing dying annuals with something fresh. It is a good time to visit your local garden center again, with an eye towards investment in your garden’s future. Many are cutting prices on summer stock to make way for their fall chrysanthemums and other seasonal items. I have scored some wonderful deals recently on clearance herbs, perennials, ferns and a few salvageable annuals. I’ve also invested in several bags of my favorite ‘Leaf Grow’ compost. I plan to buy a few bags of hardwood mulch later this week. Most nurseries will mark down their summer stock by 30%- 60%, depending on the plant’s desirability and how late it is in the season. A nursery I visited on Saturday was actually giving plants away for free, with a purchase. Persian Shield grows as an annual in our climate. I found this one on clearance last weekend, and have taken cuttings from it to spruce up late summer pots. As you cut back spent perennials, or remove fried annuals, replenish the soil with some fresh compost and plant something that will look good for another few months. I’ve planted small pots of bronze fennel, Echinacea, and Lantana ‘Bandana’ in full bloom, over the past week. Earlier in the month, I planted a half dozen Mexican bush sage, Salvia leucantha, all of which are growing well. I expect the Lantana and Salvia to grow enough to fill in empty spots with bright flowers until frost. I also purchased a huge, overgrown Persian Shield, Strobilanthes dyerianus, for about $2.00. I love the bright purple foliage of this striking plant. It is sturdy, drought tolerant, and can tolerate sun. After cutting it back, I re-potted it to replace an expiring annual. But all of those branches I removed will root in a glass of water! As each cutting roots, I’ll plant it into a potted arrangement that needs a bit of freshening. You can perform this bit of garden magic with many of the blooming and foliage plants available now on clearance. Our cane Begonias are covered in blooms this week. Canes root easily in water. Although it is still way too early to plant winter annuals, you might find some good evergreen perennials or ferns mixed into the clearance at the garden center. 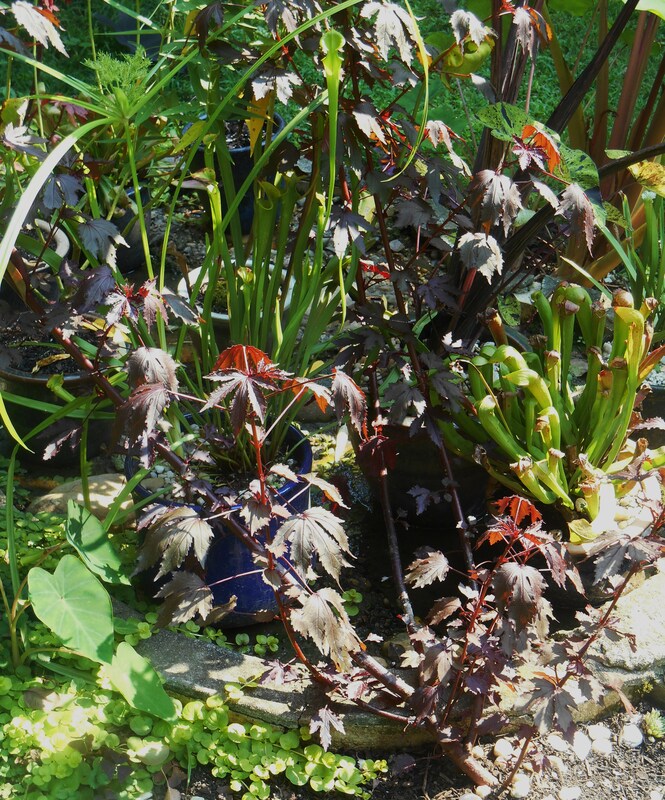 I have just planted two ‘Epimediums,’ saved from a jumble of pots marked down by half. 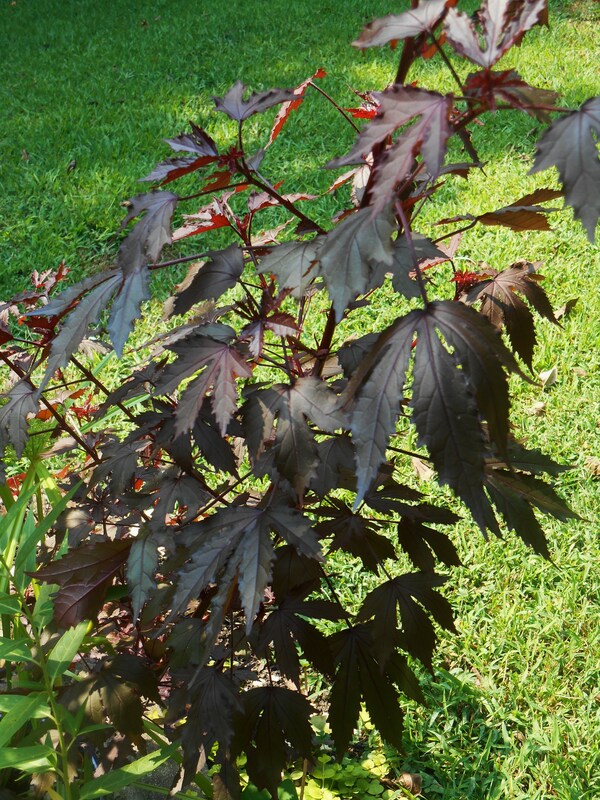 These usually pricey perennials have tough, leathery evergreen leaves. Their early spring flowers look like sprays of tiny fairies dancing on the breeze. I’ve planted them where I know Daffodils will emerge next February. Perennial ferns were mixed into the same clearance sale. Crowded, I was able to cut the clump of fern into several pieces, planting them a foot or so apart to spread the ferny joy in a shaded bed. My new ferns went into this shady bed where daffodils will emerge next spring. Potted up are Alocasia ‘Stingray’ and Begonia ‘Gryphon.’ They will return next summer, after a long winter snoozing in the garage. 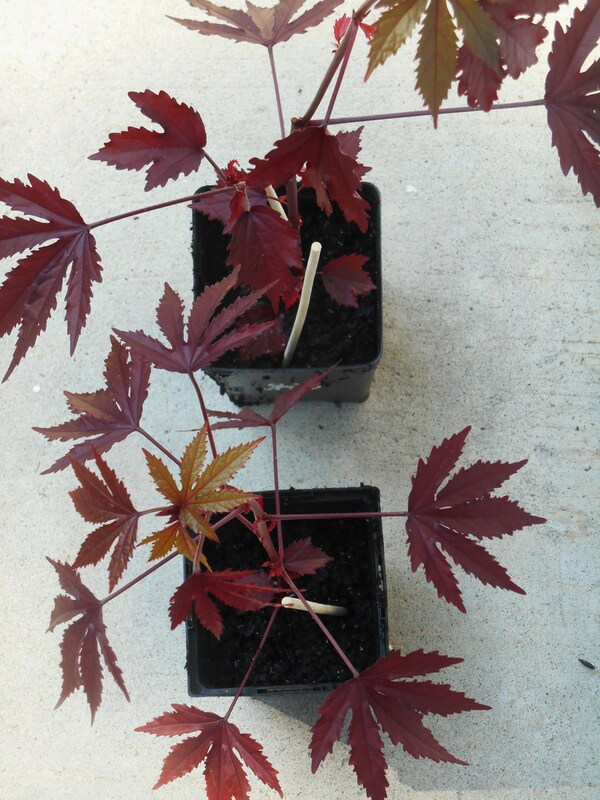 Fall is a good time to divide growing clumps of perennials you already have growing in pots. Knock the plant out of its pot, gently pull a few sections away, and pack the now empty spots with fresh soil. Water well, and let your mother plant keep on growing. You can pot up or plant each division elsewhere, and let it grow on. You may want to shelter the new potted division in a shady spot for a few days to let it establish, before moving it on to its destined spot. 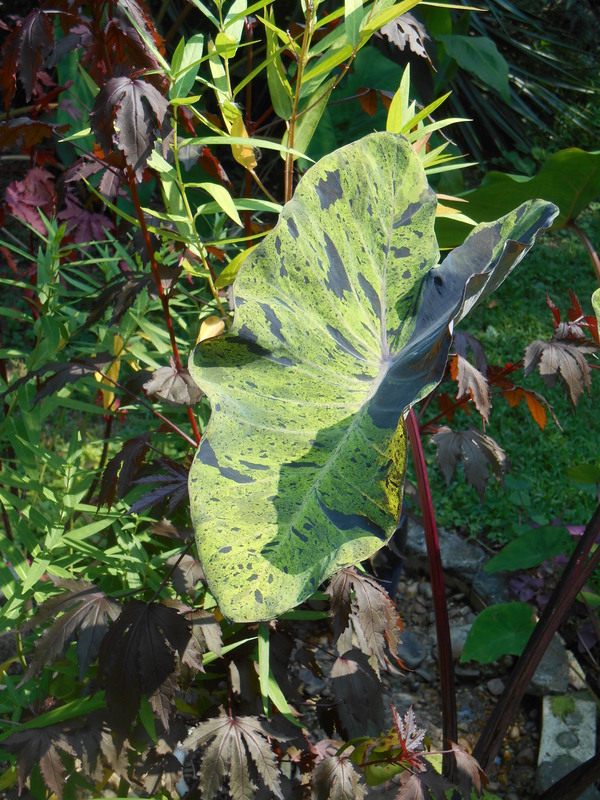 Use this same trick with perennials, like Colocasia, spreading by runners. 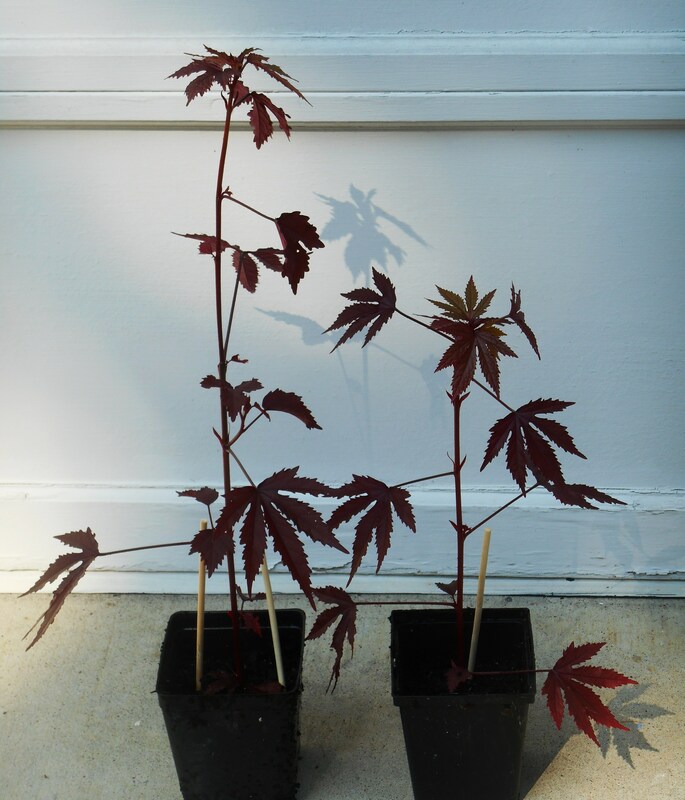 Moving offsets now will give them a few months to establish before the leaves are killed by frost. Colocasia ‘Mojito’ produces many offsets, which can be pulled off of the mother plant and potted up to grow quickly into mature plants like this one. I learned a new trick, last week, too. Admiring a friend’s kitchen windowsill garden, I noticed her Caladium leaf had grown both roots and new leaves in a glass of water. Her leaf had fallen over in a storm. 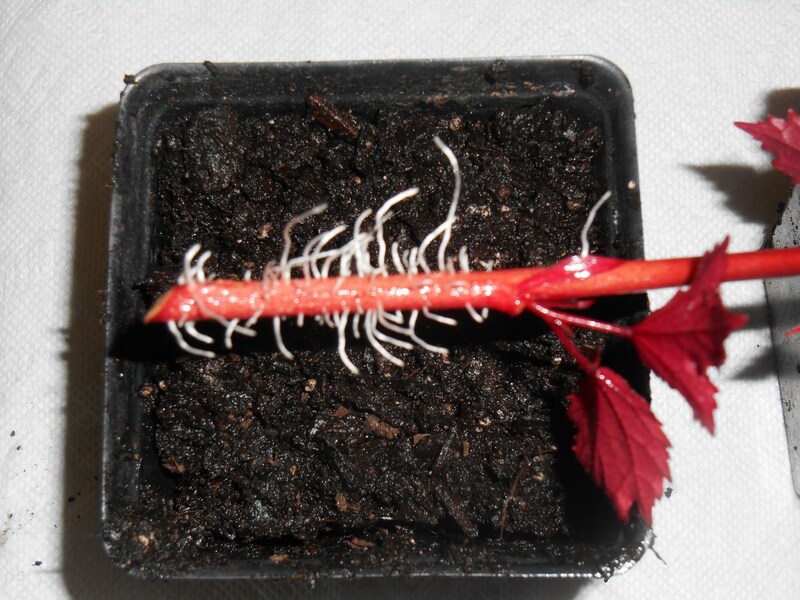 When she pulled it, it came with a bit of the tuber attached at the base of the petiole. From that tiny beginning, a new plant was forming. When she pots up the rooted leaf, a tiny tuber will grow from these new roots. This is one way to increase your Caladium collection; though one shouldn’t do it with any new patented Caladium variety. All sorts of bits of plants, trimmed away in a late summer clean-up, may be rooted. My kitchen windowsill, and the bright space around my sink, is full of cuttings rooting in bottles of water this week. I plant these out into small pots of soil as their roots form. Pruning away spent flower clusters from many perennials and woodies will likely earn you fresh flowers before frost. Keep those butterfly bushes, crape myrtles, Salvias, Dahlias, roses, and even Joe Pye weed dead-headed, and the new flower buds will keep forming. You can extend your season of bloom for many more weeks with this attention to detail. Always remember: plants want to grow! It requires just a little effort on our part to assist them. Dead head spent flowers from woody shrubs, like this crape myrtle, to keep new flowers coming. Joe Pye Weed will also continue to produce flower buds if regularly trimmed of its old flowers. Newly planted yellow Lantana and bronze fennel now fill the empty spaces in the bed at left, where I’ve also added a bit of compost. The white flowers are self-seeding garlic chives. Once the rain has finished, I’ll head back out to the garden to top-dress many of our beds with an extra inch of compost. And I’ll follow that with an inch or so of fresh mulch over the next week. This will offer a little nutrition to the soil, and help lock in the moisture we’re receiving from this storm. Our cadre of earthworms will appreciate the effort. Gardeners learn many tricks to perpetuate the beauty of their garden year to year, and through the changing seasons. We learn to multiply and nurture what we already have, and minimize what we might need to purchase season to season. Late planted Caladiums have struggled with heat and drought this summer. (photographed last Thursday, when I was keeping them watered by hand.) Now that we’ve had significant rain, they will surely shine through the next few months. Color drains from the garden as frost works its wintery magic. Leaves turn brilliant orange, scarlet and gold before tumbling from their trees on autumn winds, soon to turn soggy and brown underfoot. Newly bare branches stretch high against the sky, sometimes blue but often grey and sodden. Shiny green remains only on our evergreen shrubs and trees, now brilliant against an otherwise drab and barren landscape. We admire red berries against prickly holly and soft Nandina leaves and purplish blue ones now noticeable on the Wax Myrtle and Ligustrum. Yet some of us crave flowers, even during the restful months between frosts. It would be altogether too depressing to me, a Virginia girl, to face long months ahead of a dormant garden without anything in bloom. In Zone 7 and south, we can enjoy flowering shrubs, annuals, perennials and bulbs during the winter. Even through periods of freezing weather, snow, ice storms temperatures down into the teens; these plants soldier on. When they thaw, they just keep growing. Some of these plants still grow and flower through the winter in zones well to our north. This is the time to plan for winter flowers. Find a good selection of Violas, Hellebores, shrubs and bulbs at garden centers now. Plant through the end of December, at least; and enjoy these beautiful plants for many years to come. 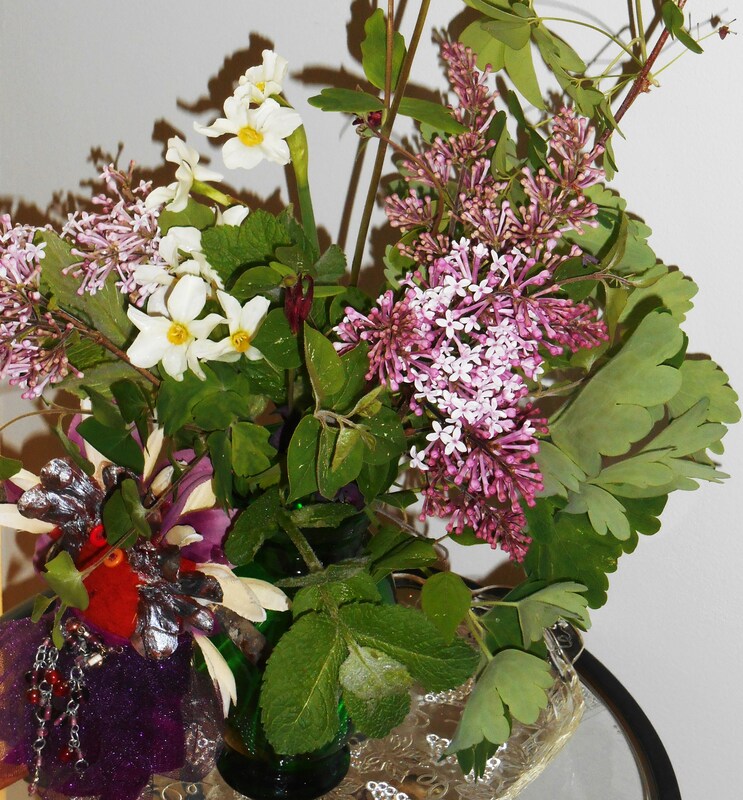 Winter flowers are brighten our gardens and bring a touch of joy to frosty winter days. This lovely Lilac, another gift left by previous gardeners here, is revived. Covered in blooms again, with lush spring growth, it is finally performing better than it did that first spring we found it in our new garden . Revived, you wonder? What happened? There was the small matter of Holly Tone, spread generously for its acid loving neighbors….. The Lilacs, there are two, are planted among Hydrangeas, Forsythia, and a Rose of Sharon. I spread Holly Tone pretty generously on all of the acid loving shrubs our first few autumns in this garden. Azaleas, Hydrangeas and their cousins love Holly Tone and respond with vigorous growth. But not the Lilac, which prefers a sweet soil. And these let me know right away that I had made their soil inhospitable. It was a sad and sorry sight to watch them struggling along these past few years. We gave them a little lime from time to time and some Plant Tone. The crisis is finally passed, and they have covered themselves in abundant blooms and beautiful leaves for the first time in several years. A large ‘Rose of Sharon’ tree towers over our Lilac, with Forsythia and Hydrangea shrubs behind. These have grown together in the garden for a very long time. It is wise to plant Lilac with at least 6′ feet all around for its future growth. 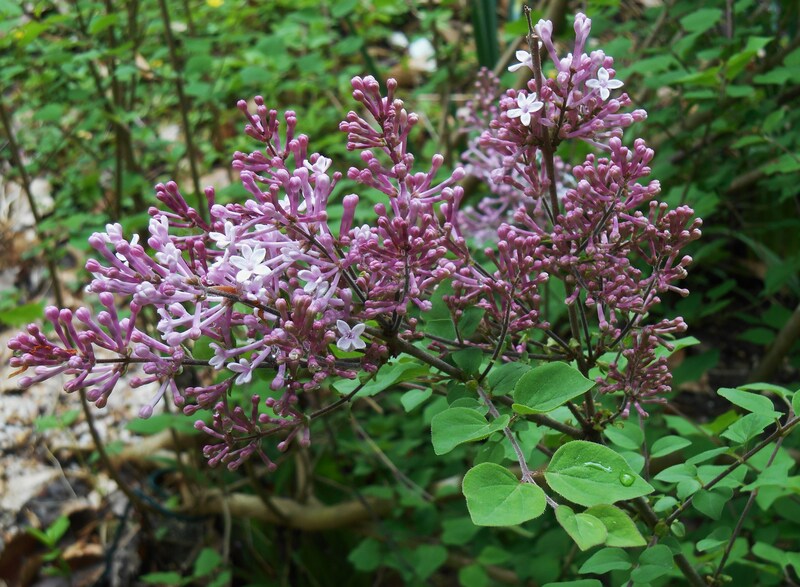 Lilac shrubs enjoy full to partial sun and consistently moist soil. They have few pests and require little or no maintenance. Lilacs will grow into small trees if allowed, so plant them with plenty of space! Deer won’t bother them, and they offer plenty of nectar for pollinators. I order Lilac shrubs from mail order nurseries and grow them in a pot for their first few seasons, then move them out into the garden. This is our current potted Lilac, our first with a white flower. We will plant it in the garden after its bloom has finished. Lilacs make wonderfully fragrant and colorful cut flowers. 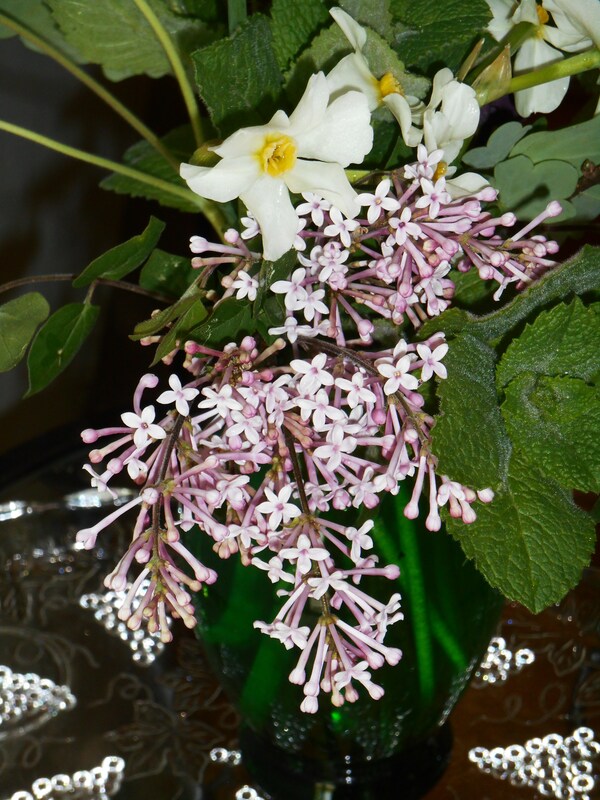 Cutting lilacs to bring indoors is simply ‘pruning,’ which should only be done after they bloom each spring. Prune too early, and you prune the flower buds away! These long lived shrubs have been popular in both home and public gardens in Europe since late in the 16th Century; and in North American gardens since early colonial times.. There are Lilac enthusiasts who showcase their Syringa collection as the ‘bones’ of their garden. They prove excellent additions to our Forest Garden. The sweetness in the air today wafts in whenever the door is opened. It envelopes one in warm enticing fragrance with each trip out of doors into the heavy, moist air. We had storms last night with wind and rain. But the dogwoods held their flowers. 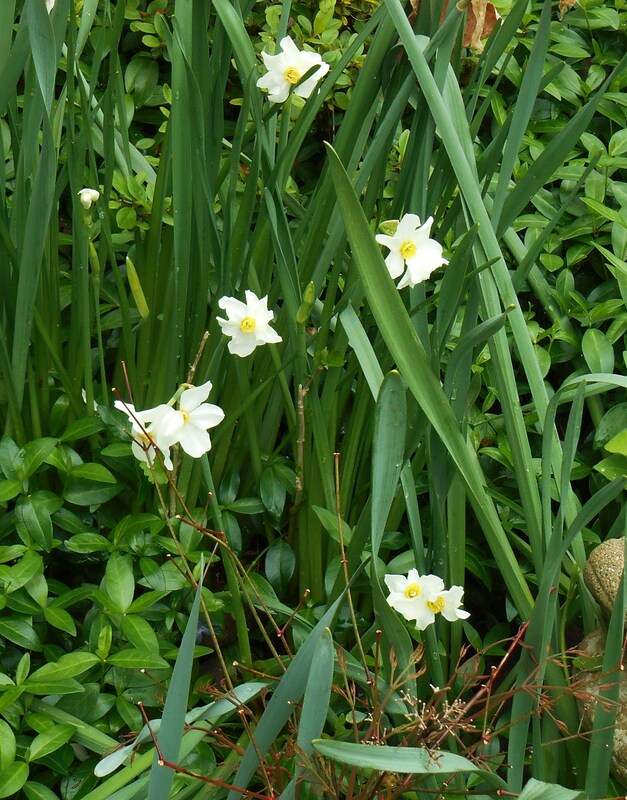 A few more daffodils have fallen over perhaps, and the newly leafed out roses bend nearly to the ground under the weight of their wet leaves. Perhaps the pruning should have been more aggressive, after all. But no matter, soon they will cover themselves in roses. There will be time for pruning when the first flush has come and gone. The lilac shrubs in the butterfly garden began to open yesterday. Last night’s rain left them sparkling and lush, and still full of buds. All of these shrubs came mail order over the last four years. They are Syringa ‘Josee,’ a dwarf reblooming variety with superior disease resistance. 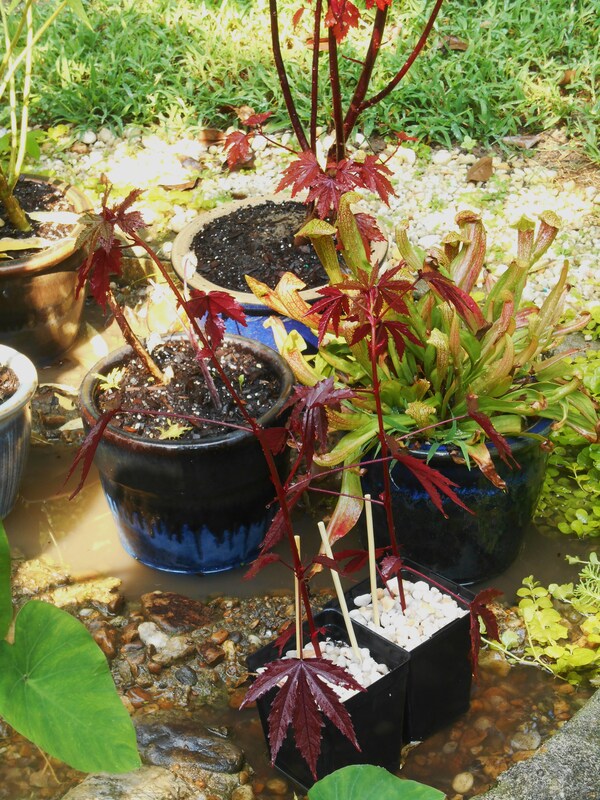 They came as rooted whips, and spent their first year or two in a pot. As they outgrow their pots I plant them out where they enjoy the afternoon sun. 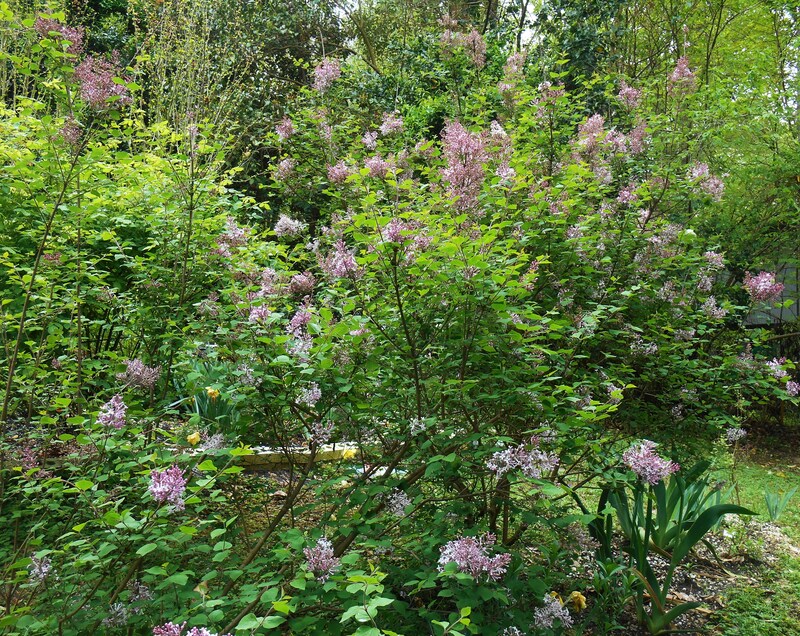 They have all the beauty and fragrance of traditional lilac shrubs, but won’t grow much taller or wider than 6′. 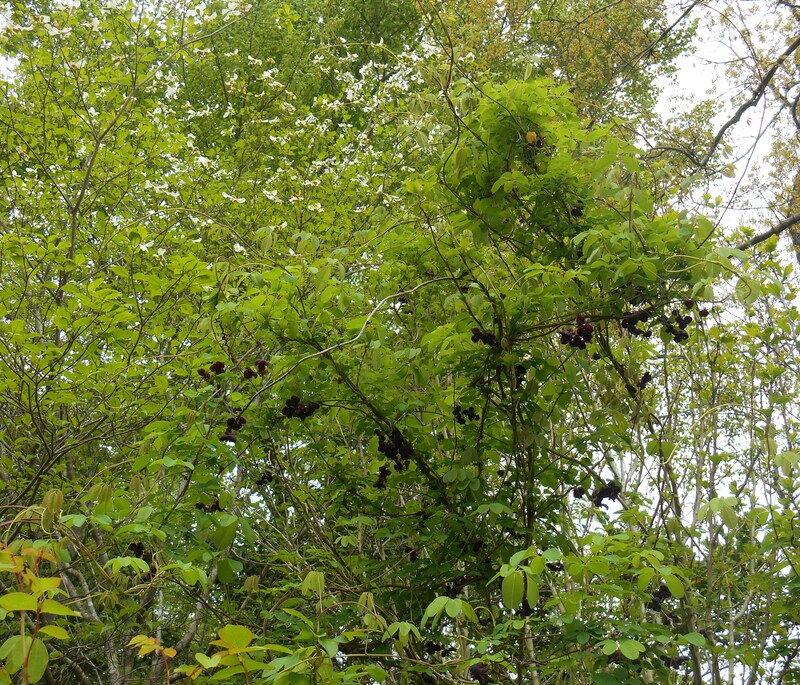 They will re-bloom sporadically through summer and into the fall. This is one of the shrubs predictably pictured in many winter garden catalogs. They always go on sale in spring, grow quickly, and make a lovely container planting for a season or two. 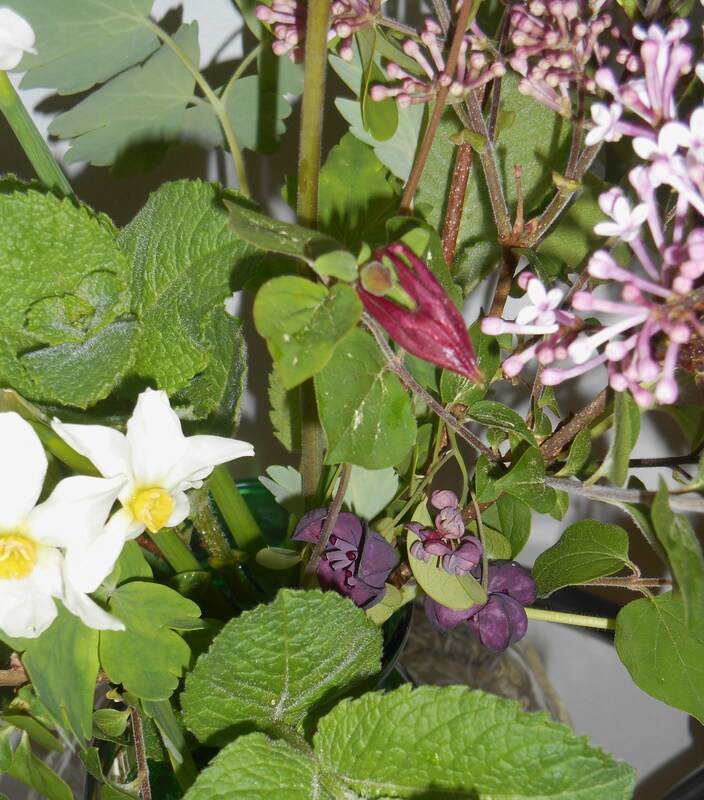 Also in today’s vase is the first of the Columbine to break bud, Columbine leaves, apple mint, late Narcissus, and a piece of our Akebia vine. Rain has hovered nearby all day, with periods of bright sunshine poking through only occasionally. The garden is wet, and more storms are forecast for this evening. I brought the flowers in for photos, and the cloudy day made it feel a bit dimmer than usual as I photographed this springtime vase. 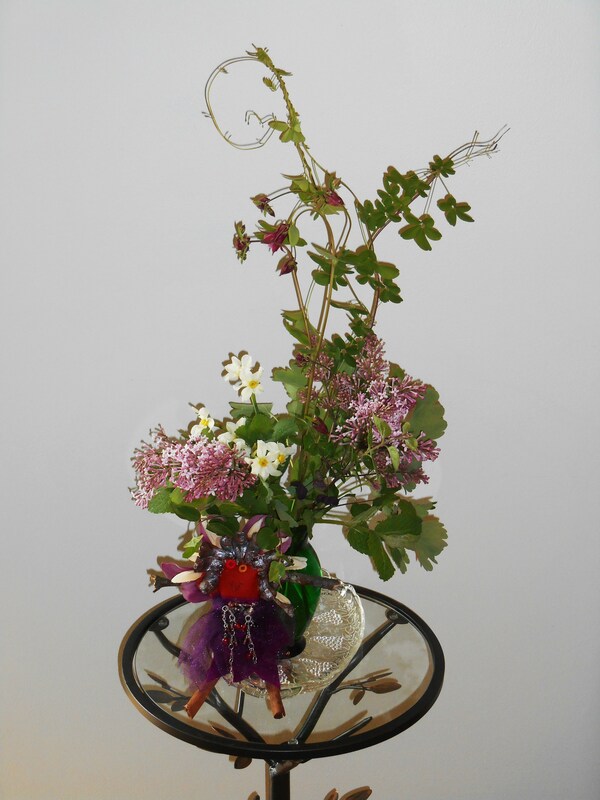 You may notice a beautiful little fairy sitting with the vase today, an original creation by Creekrose, given to me earlier this week. 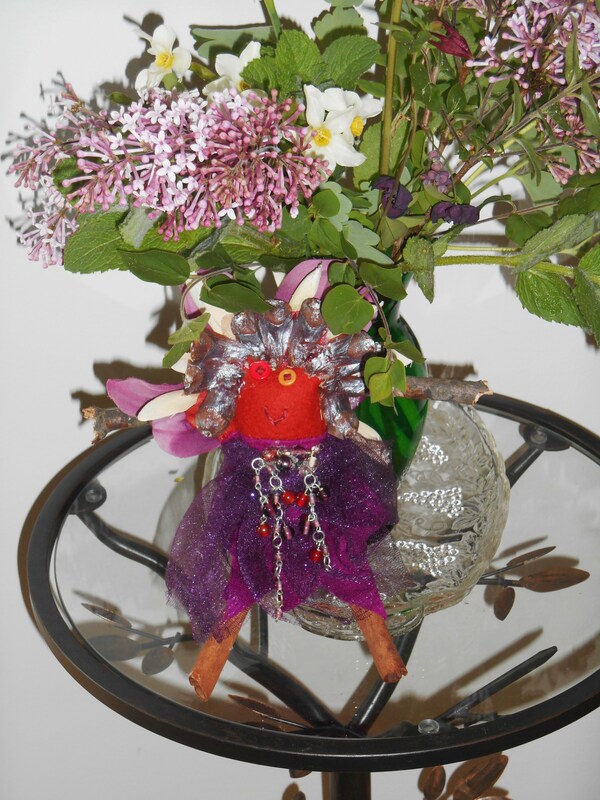 This exquisite little handmade doll feels full of the happiness of springtime, and was dressed to match today’s vase. Such a loving gift from, and so much enjoyed already. We can feel the transition in the garden now to late spring. The Daffodils have nearly finished, buds cover the roses, more perennials have announced their survival, and our trees are all leafing out. The shade will arrive just as we need it, now that temperatures continue to climb towards summer. Please remember to visit Cathy at Rambling in the Garden, who generously sponsors A Vase on Monday each week. 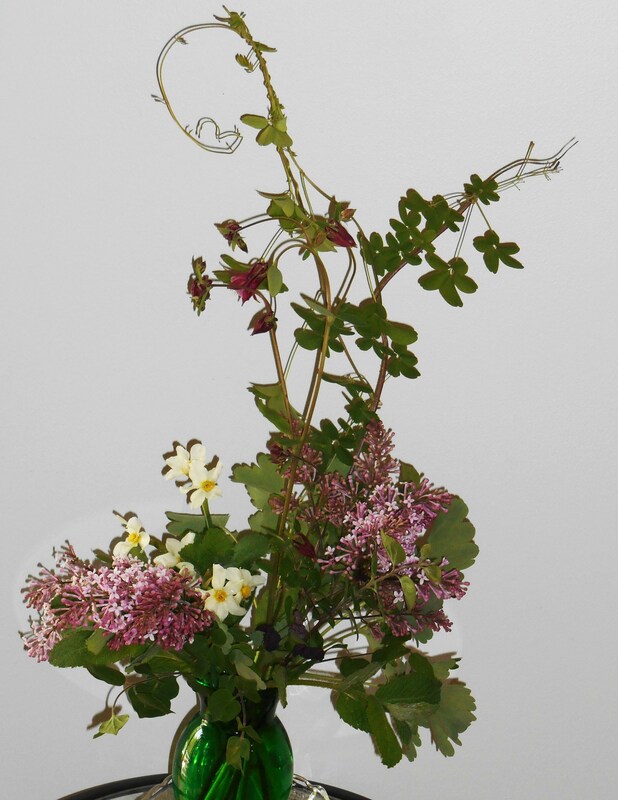 You’ll find links to many wonderful arrangements of spring flowers in her comments. I’m always delighted with the beauty picked from others’ gardens. It makes the world feel a bit smaller to see the same flowers blooming many thousands of miles away. But once a flower is cut and brought inside, it seems to subtly change somehow. I appreciate them more, and take time to really see the unique beauty of each once they are placed in a vase. If you do cut a few stems from your garden, please share them in a post, and link back to the comments in Cathy’s post this week, and mine, so we can all enjoy them with you.